Probiotics: What's the best one, will they make you healthier… and what the hell are they anyway? Probiotics can encourage the growth of good bacteria in the gut. But what's the best way to take them… and are they actually any good? Much has been said about ingesting probiotics as part of a healthy lifestyle. Although most experts – and even the makers of the products – agree that they're not essential to your wellbeing and 'wellness', there are claims that they are beneficial. Of course, some will argue that probiotics is pure marketing guff, to get you drinking more yogurt-based drinks on a regular basis. However, since you're reading a buying guide to the best probiotics, we'll assume you don't sit in that camp. Small bottle of yogurt-style drink in hand, let's press on, then. For that, we shall refer you to an expert and in this case, it's Matthew McEntegart, a nutritional consultant for The Optimal Life, an organisation that works with high performing individuals from both the sporting and corporate world, to help them optimise different areas of their lives through nutrition. He says: "Arguably one of the most important systems in our body is our digestive system. Within our gut we have a community of bacteria, which play a crucial role in our immune defence systems, digestion and the absorption of food we eat. There are good strains of bacteria, and there are harmful strains. Probiotic foods and supplements contain the good type!" So there you have it: they're a good type of bacteria that assists the immune system in its daily chores. But what exactly do they do to the body? "Probiotic supplements and foods replenish the good strains of bacteria in our gut and encourage the growth of more bacteria in the hope that the bad bacteria never gain enough numbers to become problematic to our health," explains McEntegart. As previously mentioned, there are very few professionals out there that will say a daily intake of probiotic supplements is essential to good health, but they can assist the immune system and generally promote good gut health and the digestive system is "one of the most important systems in our body," according to McEntegart. "Probiotics supplements can be extremely beneficial for those that may have problems with digestive health or are recovering from courses of antibiotic treatment," he says. "Antibiotics work by stripping clean all the bacteria strains from our gut, both good and bad, so it's important that we are replenishing it with the good stuff. "Most of us, at some point, have needed antibiotics, or suffered with a stomach bug and these are just two scenarios they could be of value," he says. Probiotics are said to be particularly good for those with weakened immune systems or individuals with IBS and other chronic digestive complaints. After all, 70 per cent of the immune system operates in the gut and intestine, so it pays to make sure the tummy is in good working order. Thankfully, friendly bacteria can be found in plenty of foods that are easily incorporated into daily diets, but they're also simple to quaff in liquid or capsule form, thanks to the rise of probiotic drinks and supplements. What's the best way to take probiotics? With a little culinary know-how, it's easy enough to get a bunch of these good bacteria into your guts via a healthy diet, as McEntegart points out that the gross cottage cheese-ish stuff Kefir contains a huge amount of CFU’s (colony forming units), but you have to physically get it down you first. You could also try sauerkraut, kimchi, fermented miso and black garlic, but the easiest, quickest and least gag-inducing way is via a good quality supplement and most of these now come in a drink, capsule or powder form. "When looking at supplements, make sure they are good and signs of quality involve the amount of CFU’s (colony forming units) contained within, as you want a good diversity of strains to inhabit the gut," explains McEntegart. "Good quality supplements will sometimes also have a time released or enteric coating meaning they can withstand the harsh environment of the stomach to make to the small intestine," he adds. Where other drinks on this list contain probiotic properties, which can be a pain to store and result in a questionable amount of useful good stuff entering your gut, Bimuno is a food supplement that contains prebiotic properties that promote good gut bacteria. 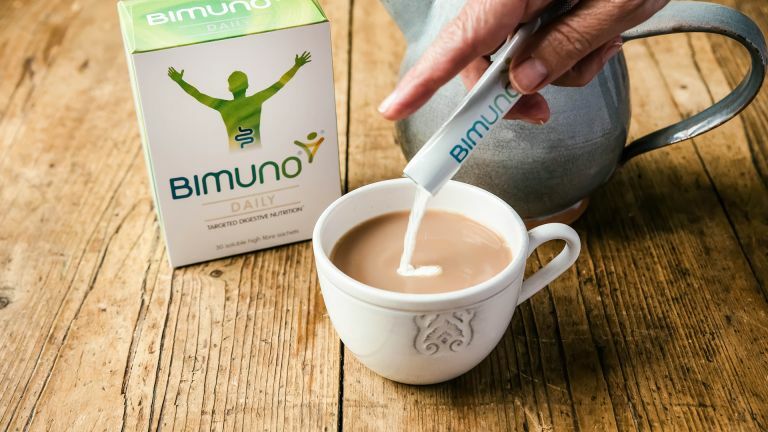 Bimuno Daily is designed to be taken, erm, every day, and can be added to cold drinks, hot drinks, sprinkled on food or blitzed up with a morning protein shake. There is a slight taste to it and those adding the powder to a cup of tea will likely notice the difference, but it's way more manageable than chowing down on kimchi or glugging Kefir first thing in the morning. As with most of these products, users will likely only start to feel the results after a week or so, meaning you have to incorporate Bimuno into your daily routine to get the most out of it. There are also products that target digestive nutrition, as well as high fibre pastilles that are great for taking on travels. Unlike other probiotic drinks and supplements, there's no need to store Bio-Kult in the fridge because the friendly bacteria are 'cryoprotected' during the freeze-drying process. It's a fancy term, but these 14 strains of bacteria stand a much higher chance of battling through the harsh acid environment of the stomach and delivering the payload to where it's needed. Capsule form also means there's no unsavoury taste left in the mouth but they can be pulled apart and the contents sprinkled onto food or mixed with a drink if you have an aversion to tablets. At £29.99 for 10 bottles, this daily shot of health is an expensive way of taking care of your gut, but it's packed with plenty of natural ingredients (11, to be precise) that help stave off digestive related issues. Liquid marine collagen, ginger, aloe vera, Bladderwrack seaweed, Bilberry and peppermint are all squeezed into each 18 calorie bottle, which can be chugged down in one quick shot or blended with a morning smoothie. We would recommend the latter, as the taste can be quite challenging, especially when taken early in the morning. These 100 per cent natural, dairy-free, gluten-free and lactose-free shots are great for anyone with a sensitivity to any of the above, while the tasty chocolate and vanilla flavours make quaffing the daily dose a joy. Unlike some of the other products on this list, the billions of live cultures have to be handled with care, so that means the drinks are delivered refrigerated and they only have a shelf life of 18 days, so you'll find yourself regularly re-ordering. That said, Biomel claims its probiotic cultures are ten times stronger than those found in yoghurt and Kefir, with the active ingredients designed to survive and thrive in conditions where other probiotics cannot. These bad boys will set you back £125 for a pack of five but Rhythm claims it packs more cultures than any other, meaning its powerful five-day course can be enough to sort even the most twisted of guts out. The initial outlay bags 200 billion live, dairy free, kefir cultures that are raised in coconut and come traditionally fermented, meaning the concoction 'floods' the guts with good bacteria every day. Of course, we can't say if it's actually any better for you than the cheaper options on this list, but surely it's the gold standard of probiotic at this price?